Heat oven to 350°F. Grease bottom and sides of 13x9-inch pan with shortening and lightly flour, or spray with baking spray with flour. In large bowl, beat all cake ingredients with electric mixer on low speed 30 seconds. Beat on medium speed 2 minutes, scraping bowl occasionally. Pour into pan. In chilled small bowl, beat whipping cream with electric mixer on high speed until soft peaks form; set aside. In medium bowl, beat cream cheese, powdered sugar and 1 teaspoon vanilla on medium speed until well blended. Fold in whipped cream. Spread topping over cake. Refrigerate up to 6 hours, if desired. 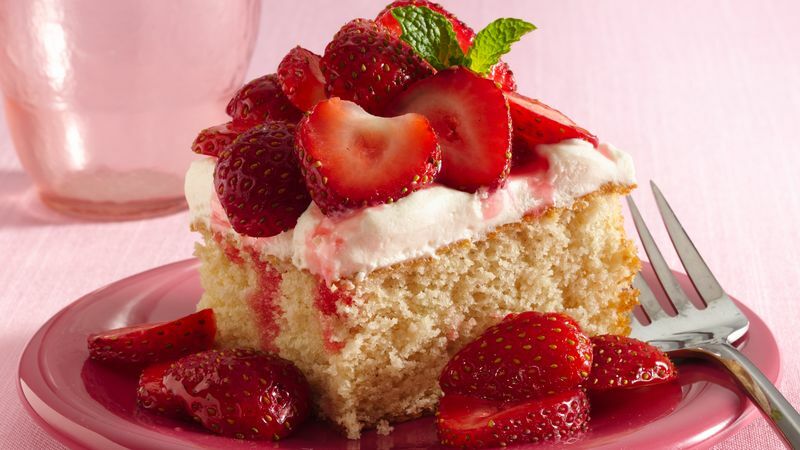 To serve, cut cake into squares; place on individual dessert plates. Top with strawberries. Garnish with mint.